Each year, the Theta-Rho Chapter of Sigma Pi hosts the “Altruistic Campus Experience” (ACE) Project. The ACE Project, which was officially started in 2003, has become an annual tradition at Grand Valley State University. During this week, Sigma Pi members commit themselves to performing what they call “random acts of kindness.” This year, ACE week took place between Monday, April 8 and Friday, April 12. Sigma Pi members performed random acts of kindness – such as bringing donuts to GVPD and passing out encouraging notes with candy to students in the Mary Idema Pew Library – and then posted a picture with the tag #SigmaPiACEWeek. On Tuesday, March 26, members of Greek Life filed into the Loutit Lecture Halls for the second annual Grand Valley State University Greek Speak. Greek Speak, which was hosted in partnership with GVSU’s Greek Life Board and the Speech Lab, took place between 8 and 10 p.m. The event is a speaking competition designed to inform the audience about participating Greek fraternities and sororities backgrounds, philanthropies and brotherhood/sisterhood. Out of a variety of sororities, Delta Gamma was chosen to become the newest member of the Grand Valley State University Greek community this year. Delta Gamma, which has 151 collegiate chapters throughout the United States, is a group that focuses on “Doing good,” both on a holistic and individual scale. 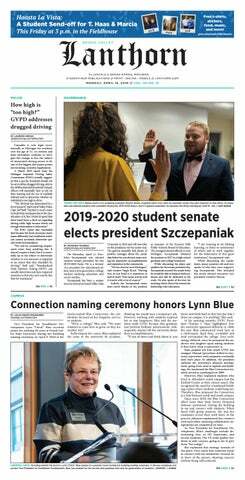 “The committee believed that the values of Delta Gamma and what they were proposing to the committee fit best with the Grand Valley community,” said Julia Henderson, the Panhellenic President at GVSU. The ninth annual A Capell-Off, a competition between university a capella groups in west Michigan, was organized by Sigma Alpha Iota as a fundraiser for Allendale Public Schools’ music department. The competition, held at Allendale High School in the Ceglarek Fine Arts Center, featured Euphoria, one of Grand Valley State University’s award-winning a capella groups. Editor's note: The following is a letter sent to Greek Life among all of Grand Valley State University immediately following the Town Hall on Oct. 31 which imposed sanctions upon the community. The letter was penned by Associate Dean for Student Life Bob Stoll. Members of Grand Valley State University’s fraternities and sororities were gathered on Wednesday, Oct. 31 by Associate Dean for Student Life Bob Stoll and GVSU’s Greek Life Board to participate in a Greek Life Town Hall where administrators announced sanctions imposed on all GVSU Greek chapters. The sanctions come off the heels of Sigma Pi Epsilon’s five-year ban from GVSU last fall, and the recent two-year ban of Kappa Sigma. During the town hall, Stoll cited four sanctions in a note from the desk of Vice Provost for Student Affairs and Dean of Students Loren Rullman. They include a ban of alcohol at Greek functions, an embargo of further Greek Life expansion, putting a relationship agreement between GVSU and Greek organizations on hold and the creation of a task force to investigate issues and expectations regarding Greek Life. The sanctions are currently in effect and will be until further notice. Crowds of students filled the streets as they made their way to Grand Valley State University’s annual Campus Life Night on Tuesday, Sept. 4. Over 400 organizations lined up their tables in Lot H to represent their favorite groups. Campus Life Night is a student organization fair that provides students with the chance to explore the various clubs and organizations GVSU has to offer. Students also were able to meet campus department staff and learn how they could benefit from GVSU’s countless resources. It’s around the time where the Alpha Tau Omega fraternity members gather up their finest walking gear to prepare for their annual 160-mile walk for multiple sclerosis, called “ATO Walks Hard.” This is the sixth year the brothers will participate in the fundraiser.